Articles about "Sharp Galapagos, Tablet PC Made in Japan" in this website is free. Read our reviews for "Sharp Galapagos, Tablet PC Made in Japan", gadget price, specs, features and find more latest Electronic Gadget Reviews and News. Sharp Galapagos Tablet PC-Japanese manufacturer, Sharp Electronics, also do not want to lose in competing in markets that are exploding tablet PC. Sharp Corp. has started selling the e-reader Galapagos in Japan this year. Next year, Sharp will begin marketing it to the U.S.. The next target, Sharp will reach Europe and China, to compete with IPAD products from the Mac and the Kindle from Amazon.com. "After the sale in the U.S., we will search for new markets where the electronic book sales continue to mengalam improvement," said Masami Ohbatake, Sharp Corp. executive business communications. Galapagos Sharp went on sale in Japan since 10 December, with a choice of two models, each 5.5 inches at 474 U.S. dollars and 10.8 inches at 653 U.S. dollars. 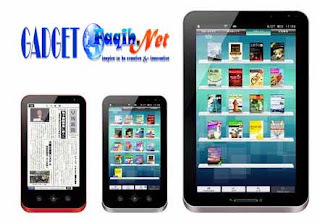 Previously, other Japanese manufacturers, Sony Corp., are also determined to generate more business e-Reader to boost their market share in the electronic book industry. Electronic book sales worldwide are expected to increase to 26.5 million units through 2014. The amount is already included sales of tablet PCs like the iPad. "I'm not sure the Sharp Galapagos Tablet PC can win the market," said Atul Goyal senior analyst at CLSA Asia Pacific in Singapore. This product must compete with similar products are increasingly widespread, but that with a fairly high price and no great brand strength will be difficult to make these products sold in the market.